3 days, on Saturday, Sunday and holiday in the second week of October in the Obama area in Nihonmatsu. 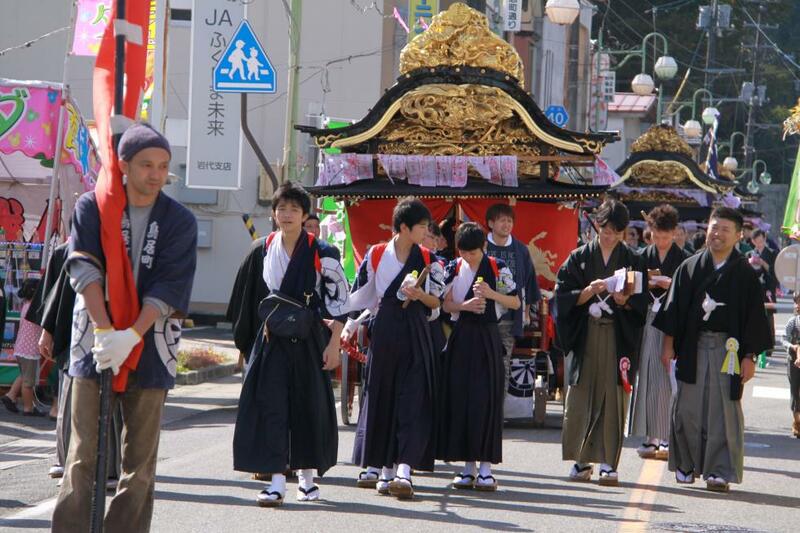 Only during the morning of the regular festival, young men parade in their crested haori and hakama (traditional men’s wear worn for special events) for the Shinto ritual miniature shrine procession, "mikoshitogyo". At that time, purifications are undertaken by the homes of ujiko (persons under the protection of the local deity)that have ofuda, which are talismans, of each town. The ofuda are divided into wooden, medium and usual styles, and the contents of each shrine's purification are different. The festival is held solemnly as a Shinto ritual that links the thoughts of the ujiko and the image of young men decked out in their crested hakama parading along the street makes those who see it feel the depth of the history of this festival. “wakaren,” are a group of volunteers who organize all the festival events for 3 days. In Obama there are four wakaren associations in the neighborhoods of Sorimachi, Toriimachi, Fujimachi and Niimachi and every evening the taikodai in each neighborhood are lit with Japanese lanterns. Even amongst these, with respect to the taikodai of the four neighborhoods, the evening part of the main festival when the taikodai of the four neighborhoods gather together on the Fujimachi slope is particularly dream-like. Also, while the sound of taikodai that has been lively falls completely silent, at the intersection (commonly referred to as "yotsukado") in the center of the town the chants of the young men reverberate and stir the hearts of all who watch the festival. The festival began with influential people of the village receiving permission from the Niwa family, the lord of Nihonmatsu, to carry miniature shrines through the village to revive the village following the Tenmei Famine (1782 to 1788). The festival has been held since 1789. It has been called the "Montsuki Festival" because the "wakaren" formally dressed in their crested haori and hakama and carrying of miniature shrines is a Shinto ritual representing the descent on the earth of the Sun-Goddess's grandson and it has continued through time without change. The sublime and solemn festival captivates spectators.